When Friday’s photo challenge popped up and the subject was “monument”, I knew I had to post photos of Independence Monument. 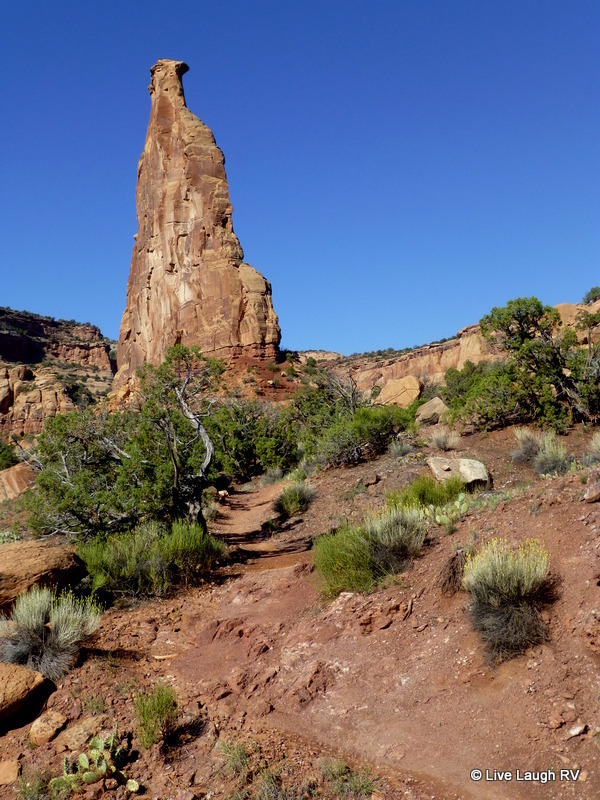 Next week we’ll be back in Colorado and the Colorado National Monument will once again be in our backyard. This monolith called ‘Independence Monument’ is probably the most photographed subject in the Colorado National Monument. 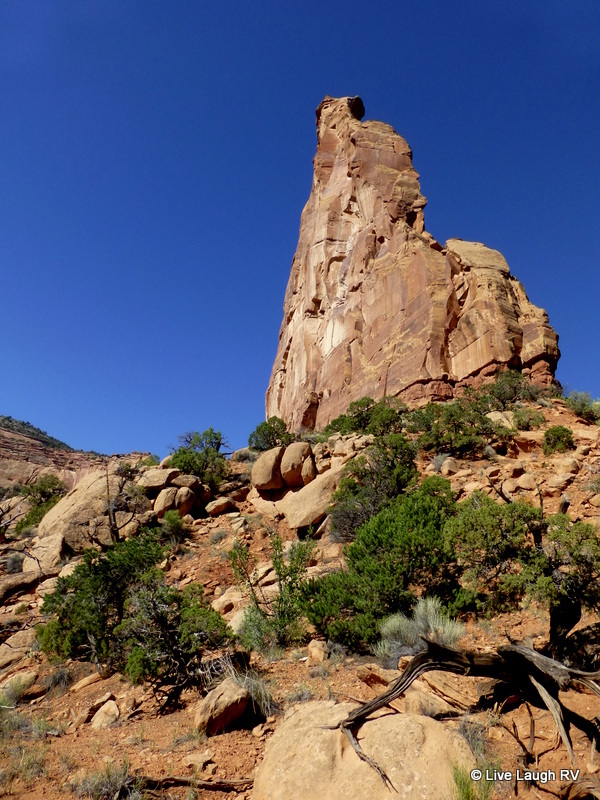 Every 4th of July, rock climbers scale this rock and erect an American Flag. Last summer, my sister-in-law and I hiked to the base of Independence Monument, something I had been wanting to do for a long time. You can read about that 5 mile hike here. Yep, I’m looking forward to hiking in “the Monument” again real soon :-) FYI…..I’m not sure why I have ads popping up on my photos, but my apologies and I’m looking into it. Next post, we’re back to our travels….. Looking forward to the day we can spend time in CO when our summer travels don’t take us back to VT.
More Colorado! Weeee! 😀 Really looks like you’re back on your kind of territories. Screw the snows. 😀 I kid. Have fun and safe travels. Lovely photos. Nearly home. You must be excited. Wow! Really beautiful photos, it’s a shame that the ads pop up in the photos. Yes, you can kill the ads, but putting the ads in your photos is just a slimy thing to do. Thank you and I think I’ve fixed the ad problems…..received confirmation earlier today! Now you’re talking! What a spectacular formation and a true monument to Nature. This was a great reply to the challenge. You MUST visit Colorado. Last summer we really started exploring more of our home state. Prior we were always busy working, kids, etc. We’re hoping to find some more hidden gems this summer. That was a great 5 mile hike and I’m hoping for a repeat in a couple of months. I figured out those ads are on a trial run with select blogs. Should I feel honored? LOL You guys would love hiking The Monument. Love The Monument… the ads not so much. I hope they stop it for all bloggers! Thank you for sharing all these beautiful photos. Hum…..not sure what’s going on with the ads. Those photo overlay ads I guess were being tried out. Sometimes they pop up and sometimes they don’t. At least there’s a little x to close the ad. Glad you didn’t get any. Beautiful – I love how blue the sky get and how big the sky is. Absolutely stunning. I love it when a challenge is issued and I know exactly what my response will be! You aren’t climbing up the rock, neck time…are you? I would be way too scared to do that! What a challenging hiking, Ingrid! This monument is majestic in every aspect! Those are real natural monuments and I can just probably sit there and marvel at it. Great photos Ingrid. Thanks ML. It is beautiful. A definite location to put on your list. Such a beautiful spot. Makes my hands sweat at the thought of climbing it…and I’ve done a lot of climbing. 🙂 Spectacular! Actually, if you look at the last photo that’s the side that they start the climb. There’s supposedly a trail half way up before the real scaling begins. I guess those ledges offer very good footing. I’ll stick to looking up at it! Often Ingrid the ‘approach’ is more dangerous than the actual roped climbing! Definitely looks like far more than I would be willing to take on even at the peak of my abilities. I don’t know why those ads recently started popping up like that. A fellow blogger is also having issues with it. Kind of a new thing with word ads I guess. You can close the ad with the little X lower right but still annoying. I found the little x this time and it worked like a charm!